Maybe it can, at CVS. CVS has a rewards program that not only earns you cash back on your purchases, but also unlocks massive savings through members-only coupons every week. That makes couponing at CVS very rewarding. 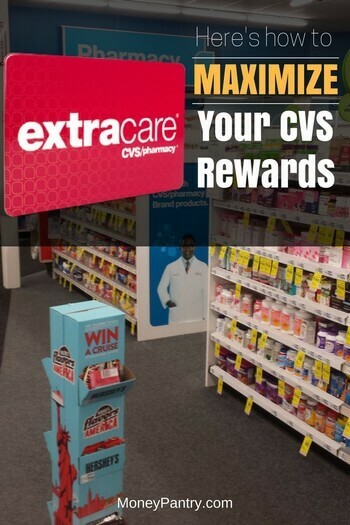 ExtraCare is a customer loyalty program offered at CVS pharmacies. As a member, you’ll get 2% back in ExtraBucks rewards every time you use your card on eligible purchases. On top of that, you’ll also be able to take advantage of extra savings in your email, on the app or in-store through special deals and members-only coupons. So if you want to save money at CVS, joining this program is a no-brainer. The first thing you need to get started is an ExtraCare card. You can snag one at the checkout counter when you’re shopping in store, or through the website, if you prefer. The online sign-up process is almost just as intuitive and easy as getting a card from your cashier. Step 1: Visit www.cvs.com and click “ExtraCare” in the menu. Step 3: Follow the prompts to fill out the form and click “submit” when finished. Step 4: On the confirmation page, you’ll receive the option to print a temporary card if you want to get started right away. I highly recommend this if you’re able to access a printer. Otherwise, you’ll wait a few weeks to receive your card in the mail. The next thing you’ll want to do, if you haven’t already, is create a CVS.com account and link your rewards membership. If you ever plan to shop online, or if you just want to be able to check your balance from wherever you have an internet connection, this is an important step. You’ll also be able to access your card number online if you ever lose track of your physical card. From the CVS homepage, click “Create an Account” in the top right-hand corner of your screen. Next, it will ask you if you have an ExtraCare card. If you just created one or if you know you already have one, enter the number where it asks or use “look up” to find your info. Now, you’re ready to shop. Whether you’re shopping online or in person, use your ExtraCare card at checkout (if you’re online and your accounts are connected, this should be automatic) to earn and use rewards and to access your coupons. Before you start to shop, check the weekly ad. If you don’t have access to the printed ad, you can go online and click the red “weekly ad” button at the top of the CVS home page. You can also have it emailed to your inbox. When you’re thumbing through the ad, you’ll see different ways to save on specific items. Take advantage of these opportunities or stack them for maximum savings. When you log into a connected account on the app or CVS website, you can see all the coupons available to you and send them to your rewards card for use. In my account, currently, there are 135 coupons available. That’s cool, but also a tad overwhelming. To sort through them and choose only the ones I’m likely to take advantage of, I can use the sort function at the top of the page to see “new” coupons, “only for you,” “ExtraBucks,” “expiring” and more. When you find the ones you plan to take advantage of, click “send to card” to send the offer to your rewards card before you shop. That way, savings can be applied automatically when you check out. The coupon center is a large yellow and red kiosk located inside a CVS store. It is clearly marked “Coupon Center” and has a touchscreen interface. Present them at checkout to save. It’s that simple – and you don’t have to worry about buying ink or printer paper. If you prefer printing coupons yourself, it’s still possible anywhere you have access to a printer, as long as you’re logged into your rewards-connected CVS.com account. There are a number of different types of savings you can earn with CVS. Thumbing through the catalog this week, I noticed a sale on Colgate Total Advanced Whitening toothpaste. It’s listed as regularly costing $4.49, but as a cardholder, I can get it for $3.49. Plus – it says I can find a manufacturer’s coupon in most newspapers to take off an additional $0.50, and get $2 more off with an instant coupon from the coupon center. That’s a 78 percent savings! I’m basically getting toothpaste for $0.99 – you can’t beat that, really. Another member discount, Renewing Argan Oil of Morocco shampoo is on sale this week – with the opportunity for members to earn ExtraBucks Rewards for buying it. It looks like I can either buy one, get one 50% off, or buy three and earn $8 in ExtraBucks Rewards, to be redeemed later. ExtraBucks can be used on anything in the store! You can also use them with other coupons. Also available this week on my ad are several “cash card” offers marked with little pink tickets that say “10” on them. The description says I can earn $10 when I spend $30 on items marked with that symbol. All of those items are collected in a colored box on the front of the ad. What purchases are ineligible for rewards? Certain items do not count toward rewards. You also cannot use rewards on these purchases. Also any imposed governmental fees or items reimbursed by a government health plan belongs to this category. Some rewards will print on your receipt when you make a purchase that qualifies. Others accumulate and pay out on your receipt, at the ExtraCare Coupon Center or through CVS.com® every quarter – in January, April, July and October. If you’re dying to know your balance, you can check it on the CVS website. Just go to the ExtraCare page and click the “current balance” or “balance history” tab. To redeem your rewards, present your rewards card and coupons to the cashier at checkout. Lost track of your card? You can use your phone number (and it’s free to request a new one if you like). If you’re shopping online, make sure you click to activate your rewards and/or coupons, then add them to your card via the Coupons/ExtraCare Rewards button. Yes – don’t let them though! If you do not spend $50 on qualifying purchases or do not reach a minimum of $1 by the end of an earning period (quarterly), you’ll forfeit your rewards. You must collect them quarterly, and when you do, they will be rounded down to the nearest dollar during the 45-day period following your earning period. You can also go to any CVS location and get a new card from the cashier. Snag ECBs through Pharmacy & Health Rewards ($5 ECBs for every 10 prescriptions filled) and ExtraCare Beauty Club ($5 ECBs for every $50 spent on these products). Always check your receipts for printed coupons. Make sure you check your email and take advantage of exclusive offers. CVS’ rewards program is a highly-rated one, especially when compared with Walgreens Balance Rewards – one of its competitors. Users generally give it positive reviews – especially coupon-savvy shoppers, who quickly learn how to maximize savings with the system. Some users even report stacking coupons and rewards for nearly free shopping trips once they’ve mastered this rewards program, although they admit it takes some getting used to. One complaint says that the best coupons expire quickly if you’re not watching closely. Is CVS Rewards worth it? Hopefully, this review has convinced you to sign up for CVS Extra Care if you haven’t already. It really is a no brainer for those of us who do shop at CVS. It’s like getting free money for buying things you were going to buy anyway.